I have had a very stressful month as my father passed away recently after battling cancer. My husband suggested finding a way to relax and pamper myself and I thought this was a great idea. Not wanting to leave my home, I immediately decided to have my own “spa” night using the luxurious products from Scented. I enjoyed an amazing hour easing away my tensions by soaking in the tub, scrubbing, exfoliating and moisturizing my skin with Scented products which felt absolutely wonderful. In fact, it was not only soothing to me physically but mentally too………. Scented is a direct sales company that offers the highest quality bath and body products using only toxin-free, naturally derived ingredients. This is especially important to me because I don’t use any products that are made using harsh, chemically laden ingredients or synthetic fragrances. My home spa evening began with the Moisturizing Bath Salts ($16) which I added to a tub full of warm water. The scent of “Fresh Squeezed Citrus” was wonderful and very refreshing and invigorating. I used the lovely wooden tool that comes with this 13.5 ounce jar of bath salts to add three scoops to the water. As I soaked, my dry skin seemed to almost absorb the moisture and felt so soft. For further exfoliation, I love the 7 ounce Body Polish in Peppermint Café ($18). A small amount of this wonderful sugar body polish uses jojoba, coconut and sweet almond oils to take off all the rough skin on my body leaving my arms, legs, hands and feet even softer with no greasy residue left behind. My skin looked like it was glowing! Do you suffer from dry lips? I do, but I hate to use most lip balms because I don’t like how it feels on my lips. With Kiss My Lips ($6) by Scented, I have found the ultimate lip moisturizer. Available in coconut and lemon lime and peppermint, this jojoba, Shea and cocoa butter based lip moisturizers are amazing and smell and feel great on my lips which I am thrilled to say are no longer dry at all when using this product. Even my husband commented on how soft my lips felt when he kissed me goodbye! 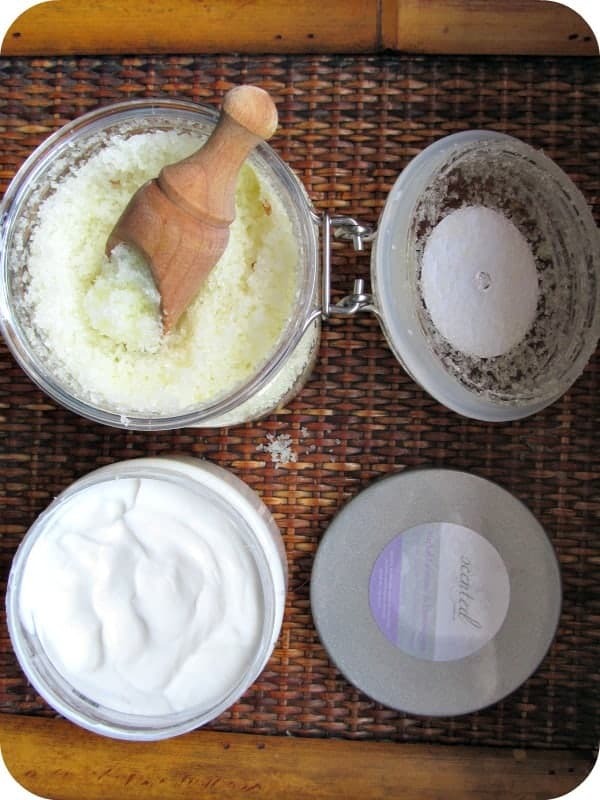 Finally, I pampered my entire body with the Herbal Lavender & Lemongrass Body Crème ($18). This body crème is so luxurious and feels very indulgent. I love the fresh scent that lingers subtly but is not overpowering. It is thick and rich and absorbs effortlessly into the skin. I have very dry legs and this cream made me feel confident and pretty. I like to keep the travel size, 2 ounce Coconut Lime Verbana in my bag for moisturizing my hands (I wash them a lot during the day so they can also get very dry). This scent is amazing too and my husband always compliments me telling me that I “smell great” after applying this cream to my skin. After an evening of luxury using Scented products I felt like a new woman! 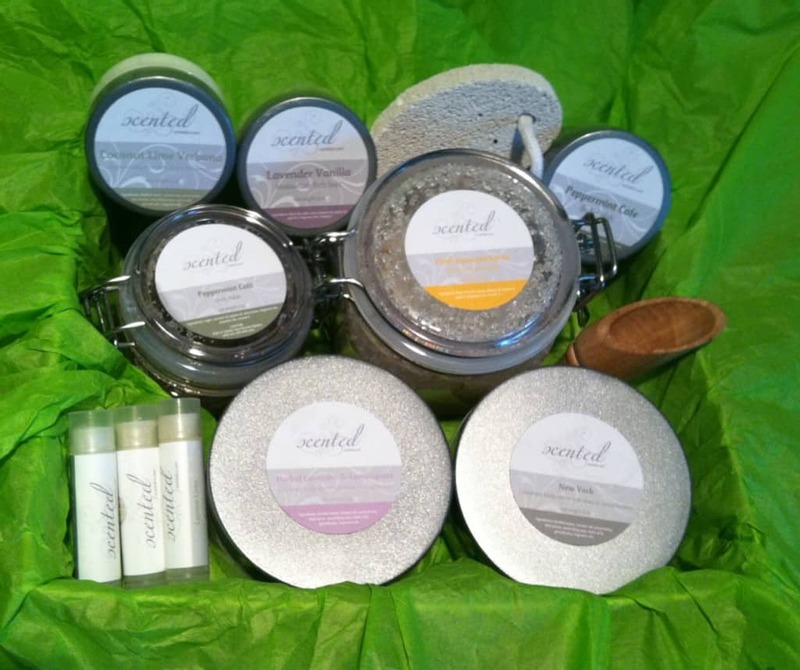 Scented has a wide selection of amazing body care products and home fragrance for you choose from and I highly recommend all of the products….it is so hard to choose my favorite because it is all wonderful and the products work so well in conjunction with the other. You are invited to visit the Scented website to browse the entire selection and try some of your favorites! I am impressed with the ingredients used, and the lack of toxins in them. I learned that they are toxin free which is great! I like the coffee body polish. Their products are derived from nature and toxin-free. The Fragrance for Life air fresheners sounds great and patent is pending. I learned that, thankfully, they contain no toxins! How nice! I learned that the products are cruelty free, which is very important to me. I learned that their products are toxin free. I learned that they are chemical free and cruelty free which are both great to know. I learned that they are toxin free . There products are toxin-free and derived from nature! Their products are chemical and cruelty free! free of chemicals, always good. I have sensitive skin! I like the bath Salts, i would love to try it out! I would love to try their fragrance for life product! I LOVE THAT THERE ARE NO HARMFUL CHEMICALS. I HAVE VERY SENSITIVE SKIN SO I WOULD LOVE TO TRY SOMETHING THAT SMELLS AMAZING AND DOESN’T HURT MY SKIN. I’m digging the no toxins part! Yuck toohey! Their fragrance blends are unique and yummy sounding! The White Pear & Peony in particular sounds heavenly! Yum! I learned that the products are natural and free of toxins! love that they offer travel sizes!! The coffee body polish sounds great! I would love to try the Mango Mandarin body creme. I would like the coffee body polish. I would love the fragrance for life. I would love to try their Fragrance for Life air freshener. Thanks for this contest. This nutrient and antioxidant-rich oil has been used for centuries for medicinal and cosmetic purposes. It is anti-inflammatory and yields tremendous benefits for most skin type, particularly those prone to breakouts. I’m interested in the coffee body wash. The Mango Mandarin scent sounds perfect! 🙂 Thank you. I learned that 80 percent of direct sellers say that direct selling meets or exceeds their expectations as a good way to supplement their income or as a way to make a little extra money and 91 percent of direct sellers say that direct selling meets or exceeds their expectations as a business in which their income is directly relative to the time and effort they put in. The products are toxin-free and derived from nature. learn that there cruelty free ty. The Body Crème looks very nice!